Some pictures have been finally released by Pathe from the film I worked on in Scotland that had the working title "The illusionist". It is a film directed by Sylvain Chomet and is his second feature film after first making the Triplets of Belleville. Thats a must see by the way if you haven't already seen it. I have no idea though when the film is due to be finally released , so I am curious like a lot of other people as to when we get to see it in the flesh, on the big screen. 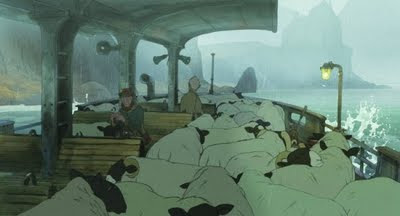 The image above is from a scene I actually worked on: I animated and cleaned-up the Shepherd and Tati and Olivier Malric did the sheep and effects and Jean-Pierre Bouchet did the compositing. I cant remember who actually did the layout and background, but as you can see it was done really well and has a great atmosphere. There is another blog entry on the film as well as some other atmospheric stills. Its not a lot, but it gives you a good taste of how the film will look. In the mean time we must wait and see when it will come, but I will certainly blog it once I know.